The romantic valley of the Loreley surrounded by the Hunsrück and Taunus mountains will make your heart beat faster. Experience for yourself the beauty of the Rhine that inspired so many poets. Like gems in so many crowns, numerous castles glitter atop the hilltops. History you can touch, with coats of armour and medieval cityscapes. In the spring white cherry blossoms blanket the hillsides like snow, and a soft cushion of green grass covers the hiking trails and serene lookout points. The summer brings excitement, with parties and music, a steamboat ride and the "Rhine in Flames" fireworks display. Crisp autumn days follow, with a panoramic view over colourful terraced vineyards. Wine and Rhine flow and immerse the valley in harvest delights. Enough stores are put aside for the quiet days of the Rhineland winter, where folk customs are reflected in the warm and inviting light shining from the window panes of the wine taverns and guesthouses. 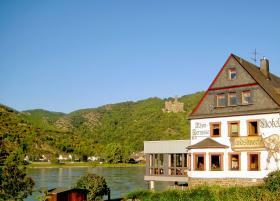 The Restaurant Landsknecht is set right on the banks of the Rhine in a beautiful solitary perch with a view of Burg Maus castle and its vineyards opposite. The restaurant in the main house is decorated in old-fashioned German style. Our terrace exudes a more Mediterranean flair, and in our Terrace Restaurant with its wide panoramic windows you can dine in style. 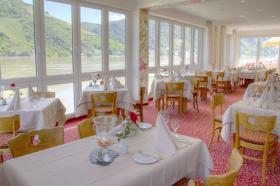 The menu features primarily regional specialties with many products typical of the Middle Rhine area. We use fresh herbs from our own garden, along with plenty of fresh vegetables and fruit from the surrounding orchards and farms. The Hotel Restaurant also includes a winery. The famous Toni Lorenz vineyard in Boppard has enjoyed great success with its fresh and fruity Rieslings, winning first prize in the „German Riesling Producers' Contest“ in 2005. Not only can you enjoy the wines of Joachim Lorenz in the restaurant; you can also purchase your favourites at our in-house Vinothek at vineyard prices. 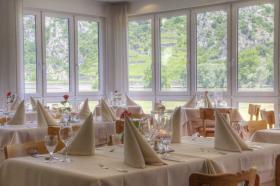 A table reservation or the booking of a menu/ offer is in the "Restaurant Landsknecht" via GlobalGuest always for free you as a guest!